Show cause notice sent to a student. Several students yesterday received formal allegations of misconduct from the university in relation to the controversial protest against pro-Israel advocate Colonel Richard Kemp in March. A university press release also states that one staff member and two contractors have been sent allegations, reportedly Associate Professor Jake Lynch and two university security guards. The allegations, signed by Professor Tyrone Carlin, the Deputy Vice Chancellor (Registrar) tell the recipients that a formal investigation by the Office of the General Counsel is now in progress, and directs them to attend formal interviews. The letter references university bylaw 62(4) which gives Carlin the authority to compel students and staff to attend an interview, though does not give him the power to compel them to answer questions. Five members of the public have also been sent allegations, though the only action the university can take is to prohibit them from entering campus. However concerns have already arisen over the conduct of the early stages of the investigation. Honi Soit has seen an email sent in March to individuals present at the protest by Jane Wright, principal of the firm Workdynamic Australia. In the emails, Wright tells the recipients that her firm had been “engaged to conduct an investigation into incidents” and invites them to attend a “voluntary” interview. Several people who attended those interviews allege that Wright identified herself as a representative of Workdynamic throughout. Both Workdynamic and Wright have a longstanding relationship with the university. A university spokesperson told Honi that Workdynamic “is on retainer to the University to provide legal advice in matters such as the one currently under review,” an arrangement the spokesperson described as “standard practice”. Wright is listed as a staff member on the Office of General Counsel website and has a university email address and phone number which are listed in the university’s staff directory. The spokesperson told Honi this was to “facilitate communication” with Wright, after Workdynamic was retained to provide “additional support”. Honi further understands that Wright was tasked with investigating the protest against Foreign Minister Julie Bishop last year, and that she identified herself as a lawyer from the Office of General Counsel while conducting at least one interview regarding that incident. Honi has also seen emails sent by Wright at the time, which identify her as a university solicitor. It remains unclear why similar procedures were not followed in this instance. 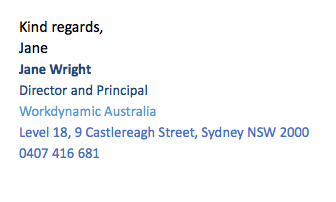 Wright’s 2014 University of Sydney email signature. Wright’s 2015 Workdynamic email signature. So it would appear that the external investigation several people thought they were engaged in was, in fact, conducted by a firm with close ties to the University. This is a concern for some, who feel the university’s approach to the protest, and its aftermath, has been one-sided from the start, particularly in light an email sent to all students by the Vice-Chancellor Michael Spence in March titled “Concerns about anti-Semitism on campus” which made direct reference to the protest. One student involved, Fahad Ali, told Honi that had he known that Workdynamic was on retainer to the university and that Wright had worked for the Office of General Counsel he would have approached his interview differently. Honi understands that several other people who have been interviewed share Ali’s view. Ali told Honi that had he and others been aware of Workdynamic’s close and longstanding links to the university, they would have pushed harder for a truly external inquiry. The fact that it was not only the protestors who received show cause notices yesterday has done little to restore students’ faith in University procedures, particularly in light of today’s revelations. Wright did not respond to repeated requests for comment through her firm and the university.